Today's Internet users can choose between a bewildering array of messaging systems. There are asynchronous messaging systems like email, file sharing and short messaging where the parties don't have to be there at the same time and there are synchronous systems like voice, video and chat. Each of these may be two party or multi-party. There are many applications that support multiple messaging modes in a single application allowing users to switch seamlessly between them but none of the applications available today offers more than a subset of the communications capabilities and very few have end-to-end security built in from the start. One approach to solving the problem shown in Monroe's graph is to provide an infrastructure to support 'intelligent contacts' so that everyone provides a list of the messaging protocols that they can be reached by. Applications can then use this infrastructure to select which protocol to use to contact each person the user wishes to contact. This approach is fine of course, once we have everyone agreeing to adopt a common interoperability technology we are 90% of the way towards writing a new unified messaging framework. Offer a compelling new functionality. The last bullet is the hard one of course. 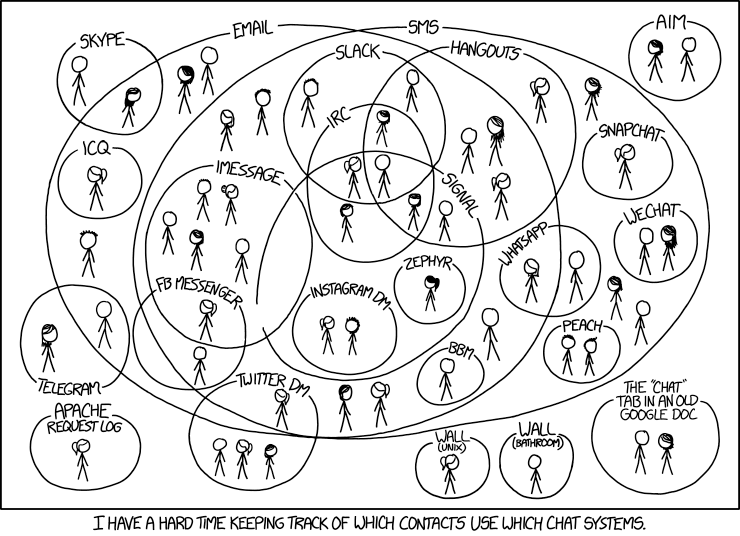 The reason so many different messaging systems have survived is that there is little to differentiate xmpp, iMessage, Facebook Messenger and the rest except for the audience they reach. And merely adding in security doesn't change the situation. The possible game changer here is a functionality that no other messaging infrastructure offers or is ever likely to. The ability to support Confidential Document Control built on Mesh/Remesh in addition to traditional messaging modes might possibly be a sufficient new functionality to drive adoption. Besides the use of recryption, the technology that allows us to unify these messaging protocols is a new cryptographic message format similar to the ASN.1 based CMS format used in S/MIME but with a new encoding designed to meet the needs of the full synchronous messaging as well as asynchronous. Mesh/Unify is based on the same collection of JSON/REST technologies as the Mesh itself. At present, the only new technology introduced is the JSON Web Container format which allows applications that can decrypt the content to interact with a Web server that cannot.